“Oh my God, I do not have time for lunch this semester!” “I have no choice but to register only for classes that are scheduled to Tuesday and Thursday modules.” These kinds of reactions were common among CNU students around this semester’s course registration period. This situation began to happen when the University Administration announced its plan to change class scheduling modules from this semester. It made many students confused because they could not understand the advantages of the new modular scheduling as compared with the existing modules. This article therefore examines the problems related to changing class schedule and seeks realistic alternatives to solve the problems. 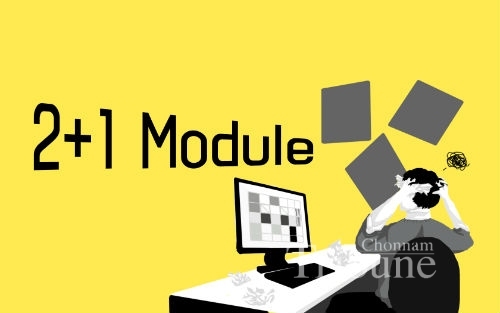 As of the 2015 Spring Semester, CNU introduced a modified system of two-unit modules, so called ‘2+1 modules’, instead of three-unit modules (Monday, Wednesday and Friday scheduling for 50 minutes each session). The newly introduced 2+1 modules should be scheduled for 100 minutes class on Monday or Friday and 50 minutes on Wednesday. Therefore, students might take courses that were scheduled according to the following modules: 2+1 modules or two-unit modules (Tuesday and Thursday scheduling for 75 minutes each session). The university authorities said that the current academic scheduling modules have been implemented to provide students with a wide choice of courses and to utilize lecture rooms more effectively. Many students, however, seemed to think the current class schedule based on the two types of modules (MW/WF or Tu/Th scheduling) is not better, but rather that it narrows down the choice of courses. Response to this current modular schedule has been divided into positive and negative types based on different experiences. As you know, most students have difficulties in making out their class schedule plan at the beginning of every semester. This time, moreover, many students were complaining of the module change because it put them in chaos. Song Du-sung (Junior, School of Business Administration) said, “I did not know well about the class scheduling module change. After making my own lecture schedule, I realized that I would not have time to eat lunch if I take the classes I want. I think the new modular scheduling is more uncomfortable than the last one.” Large numbers of students actually posted negative opinions about the issue on the bulletin boards of a community website named “JNU Square” and the Facebook pages of the General Student Council (GSC) and the CNU Media. Most of them are not sure whether the module change is really for the students or just for the authorities’ own good. 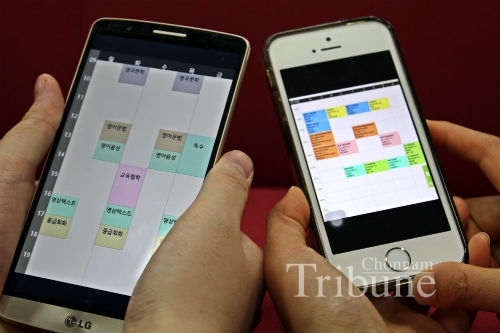 ▲ Two students compare their class schedules on their smart phones. Some faculty members have expressed concern about the class scheduling module change. Jung Jun-min (Professor, Dept. of Library and Information Science) said, “Basically, modular scheduling is needed to make a convenient and effective lecture schedule structure. However, I would like to point out that the problems have been probably raised by students because the university authorities did not construct a coherent system of lecture scheduling for them.” One lecturer also said that the new schedule seemed to make students inconvenient and professors/lecturers have difficulty in developing their instructional strategies and teaching methods according to the 2+1 modules. About the problem, the GSC Vice President Jeong Sang-yeop said, “This kind of change always requires a considerable amount time and effort. I think however the authorities definitely lacked the preparation for the change. They should have endeavored to offer information about the details of modular scheduling change to students and collected their opinions during the promotion period after the first announcement last November.” He added, “At first, the university authorities conducted a survey for five days on the CNU portal website. But 439 Students, only 2 percent of the student population, participated in the survey. The first announcement on module change was read only by a few students at that time. As a result, most students did not know about the changed system. The GSC required that the university authorities needed to listen to more students’ opinions and reflect it in the new system. Nonetheless, they decided and enforced 2+1 modules this semester.” The GSC insisted the only survey conducted by the University was not enough to gather general opinions from the university members. According to them, the authorities did not perform their own duty to communicate with students about the change and moreover, their attitude toward students would widen the distance between the University and Students. As mentioned above, it seems clear there are different points of view about the new modules. The University Administration has said the current modules are the most effective way to take courses conveniently and to activate relationships between Professors and Students. But, Students have insisted the Authorities made hasty policy after a few perfunctory procedures to gather opinions from University members, and the Academic Affairs Office should have listened to students and faculty members. The new modules have been introduced for better or worse. In order to solve the above problems, it is time to examine the effectiveness of the new modules as to whether it has improved the problems the previous modules had caused: as many classes were limited to Tu/Th modules, students’ choices of courses were narrowed down and the efficiency of classrooms was reduced. Most importantly, university authorities have to listen to CNUians’ responses to the module change more actively for the next year. Also, students should offer their feedback to make the system better. When all the university members concerns about the class scheduling system are considered and they are all involved in the process of planning and decision-making, common ground will be found that will be more meaningful to every member of CNU.